So, the backstory to entering this, my fourth attempt at an ultra was…. …my lovely wife, whom I’d run the Beachy Head marathon with the previous year wanted to run another trail marathon. Friends had also signed up, to run the marathon and/or walk the half. However, the organisers, Trail Running Sussex, when staging a similar array of races earlier in the year suffered a number of sabotage attacks the night before the race, resulting in the routes being impossible to complete if following the signs. Reluctantly, race director Stuart Mills saw no alternative but to put on one race – the ultra – as a self-navigator. In preparation for this, we spent two weekends reccying the route. Interestingly, the route was a kind of figure of eight, which allowed us to split the route into two nice-length runs, the first one from Forest Row, the second from Groombridge. The first one we used the map booklet from the website, and we got lost, a few times. The second loop from Groombridge was a little easier, as we loaded the route into the watch. Much better! Therefore, having done the preparation, my wife had to pull out, due to illness, so I was forced to consider whether to run it at all. In the end I decided to run it. One reason was, it was the first time this race had been run. I’d missed out on the first Downslink Ultra two years ago due to injury, and had been disappointed not to have run it. The other was, well, it’s another ultra to tick off, I’d done (some) training for it. The last thing to convince me was from Stuart Mills’ email the day before mentioning dropping at aid stations with transport back to the start. Well, if I fail to finish, I thought, at least I can get back to my car! The day started early, leaving home at 6:45am. The first race since I don’t know when, that I had to wake up to darkness, and temperature of 6 deg C. It got down to 4 deg C when I arrived! Timing though, was perfect. I arrived shortly before 7:30, found a car parking space in the designated field, and rushed round to register. My race number 114 was there, with my name on it! Another first! There was just enough time to grab a cup of tea before we were herded off to the temporary bank of portaloos for the briefing. Stuart introduced himself, and gave us some friendly words of encouragement. He joked the race record was 4:12 set by himself, and that if the winner didn’t beat that time, he would be keeping the prize for himself. We then walked to the race start a few hundred yards away in the centre of Groombridge village. A couple of minutes of preparation, and then horn sounded. We were off! The route takes you south out of the village, onto fields and woods round the edge of Lye Green, through the beautiful grounds of Buckhurst Park, and into Withyham, where the first (and fourth) checkpoint was. There was a herd mentality at one point where around 30 of us, all following the runner in front ended up running the wrong way for a couple of hundred yards. Tip for anyone running a self-navigate race: Never assume the runner in front knows where they’re going! It was a short detour of maybe a 100 yards, but all taken with good humour. The second aid station appeared at the top of the hill past the bridge, so I filled up on cheese biscuits, flapjacks and melon pieces before moving on. The next section I wasn’t looking forward to, mainly because during the reccying we’d got it hideously wrong, and ended up just trying to get back to Forest Row through the forest on some dubious paths laid down possibly by some deer… This time, however, the watch kept me on the straight and narrow, until I reached Royal Ashdown Golf course. This was the second error of the race caused by me (yes I know) following the runner in front! I realised he’d gone wrong, but thought he had some local knowledge. It turned out he didn’t, so I doubled back (again only about 100 yards), and went the “proper route”. We weren’t the only ones to go wrong, as a group of 5 runners joined us on the proper path from a side path about 5 minutes later. Forest Row’s Aid station (no. 3) saw us back in civilisation after 17 miles. I still felt pretty good. No problems, no niggles, no real tiredness. The path out north was quite a small path which took you onto the hills north overlooking the valley of the River Medway, and eventually back down into Hartfield. It was at this point I was starting to feel things ache, although not at a level that was going to stop me. I was running at that point with a few runners from Eastbourne, and we passed the time with a chat and me guiding them along the right route. We got back to aid station at Withyham and took stock. The next section was a lovely flat route back along the Medway valley eastward. It stayed relatively flat until we reached the railway line where we went under the bridge and up the hill toward the A264 road. A run/walk was very much in operation then, with fellow runners few and far between. I ran this bit with a runner from Burgess Hill whose previous marathon and ultra experience consisted of the Brighton Marathon the previous year, and had only taken up running around three years previously. He was still going strong, and eventually dropped me after the next aid station. Once we’d crossed the A264 we were running across the fields toward Fordcombe. This part I found the most tedious, as at that point, after running uphill for a mile or so, and I knew it would be another 3 miles before the next aid station; I was flagging mentally. We crossed the main road through Fordcombe, and carried on through the road, and onto the path to the fifth and final aid station. I needed quite a while there to gather my thoughts, and move on. What followed was a mile or so of deep wooded area west of Speldhurst and Langton Green, with a climb out into fields across back to Groombridge. I was at this point ‘running’ with an ultra runner from Horsham Joggers, Graham. A season ultra runner who has run a good few 100 milers had run a marathon the day before. It was good be able to pass the time mentally with him, as I suspect I wouldn’t have finished if left to my own devices. A few niggles had really slowed me down, including a strange pain around the knee when I lifted up my legs. This made the final drop down into Groombridge sheer pain after running 30 miles. Downhill, on tarmac, ’twas a cruel twist at the end of the route. But in the end we crossed the road through a small gate and back into the grounds of the Place. Graham left me to finish his race at his own pace in front while I toiled to the finish in 6:50:44, tired, but satisfied. Stuart handed me over the medal, mug and bottle ofwater which was gratefully received. So, to summarise, Stuart Mills and his team of marshals (mainly from Crowborough runners) put on a great race with stunning scenery which I’d like to say I enjoyed from start to finish. Well, I did, sort of. Just wished I’d run it a bit faster, and without so many niggles. But ultimately that’s my problem! Well done Stuart – keep up the good work! What do you get for your troubles? 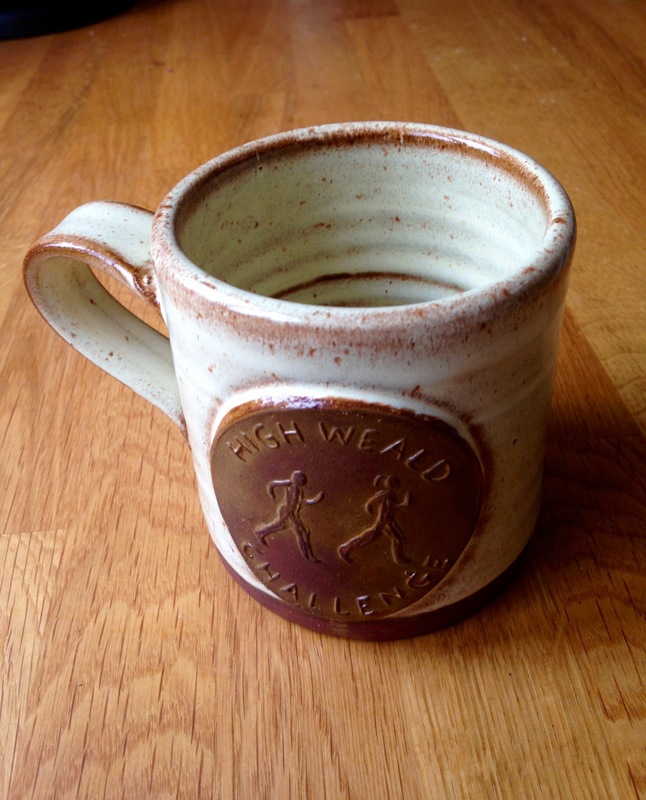 A medal, an earthenware mug (very nice! ), and a bottle of water. Oh, and a 25% off entry fee to Groombridge Place. Amenities: Portaloos, changing facilities, and tea/coffee/cake stand at the start/finish, with five well equipped aid stations. Aid Stations: Well equipped, there was nothing missing to my mind – fruit, savoury, sweet, water, coke, all there! Very friendly and helpful team at each station. Photos: Nothing official, but links to some Flickr albums and personal videos. Best Bit: Too numerous to mention. Running through Ashdown Forest, and over Pooh Bridge? Worst Bit: Between the A264 and Fordcombe. Finishing photos courtesy of Stuart Mills.